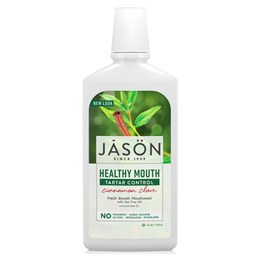 Healthy Mouth Mouthwash freshens your breath and keeps your mouth healthy, without harsh abrasives or irritating chemicals. It controls tartar in two ways: grapefruit seed and perilla seed extract help reduce tartar build-up. Tea tree oil, a well-known antimicrobial and antiseptic agent, helps defend the oral cavity against sugar acids and acid forming bacteria that could lead to periodontal problems. Aloe vera gel soothes gum irritation and the refreshing blend of clove and cinnamon oils keeps your breath fresh and clean. Aqua (Water), Glycerin, Polysorbate 20, Cinnamomum Zeylanicum Bark Oil, Eugenia Caryophyllus (Clove) Flower Oil, Melaleuca Alternifolia (Tea Tree) Leaf Oil, Melia Azadirachta Seed Oil, Aloe Barbadensis Leaf Juice*, Calendula Officinalis Flower Extract, Citrus Grandis (Grapefruit) Seed Extract, Echinacea Angustifolia Extract, Hamamelis Virginiana (Witch Hazel) Water, Hydrastis Canadensis (Golden Seal) Extract, Melissa Officinalis Leaf Extract, Perilla Ocymoides Seed Extract, Ascorbic Acid, Calcium Ascorbate, Menthol, Sodium Bicarbonate, Sea Salt, Cinnamic Aldehyde, Eugenol. Healthy Mouth Mouthwash is concentrated 2:1. If reduced intensity is desired, dilute one part mouthwash with one part water immediately before each use. 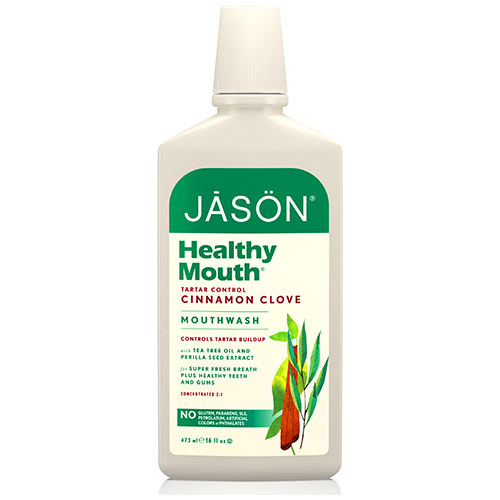 Below are reviews of Jason Healthy Mouth - Mouthwash - Cinnamon - 473ml by bodykind customers. If you have tried this product we'd love to hear what you think so please leave a review.